Same story as with the brakes, i’ve spent a tremendous amount of time and money on drivability of the car and the power steering implementation is no exception. Reminder the Power steering on this car has never “worked” since i bought it. I completely rebuilt the OE pump, Picked up another pump sent it to Lares for rebuild (took months) in the the interim bought two additional steering gearboxes and swapped my factory one for a slightly newer OE one. While on the Dyno in May at Sneed’s we talked about options and Chris suggested a GM pump. So began the hunt, the GM pumps are readily available, serviceable and CHEAP! the issue is the BMW pumps are NLA there are no more core units & rebuilds don’t make the 100-110 bar that they need to. Commonly called the GM type II which is a variant of the saginaw but uses a remote reservoir.. I ended up with the Allstar performance unit, the proper pulley combination i make the correct pressure and maintain within specs for RPM on the pump. I added a slightly longer Conti BMW V belt. Fabbed some plumbings fittings and made all new AN lines for the low pressure side. Had a custom High Pressure AN hose made. i wanted to use the factory filtered res but decided against it, because of the sealing issues and crummy filter. 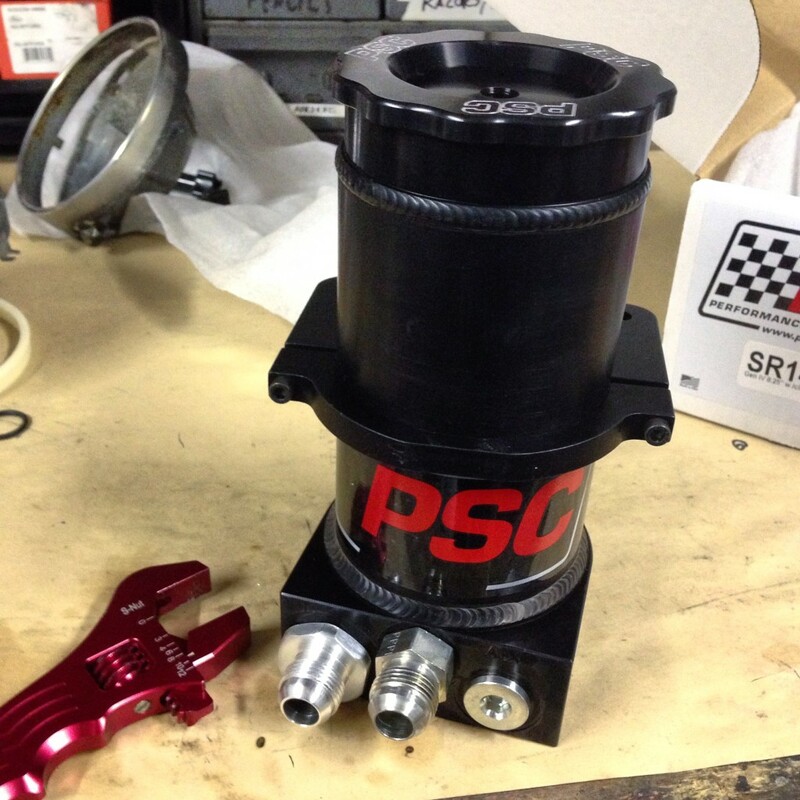 I went with the glorious Billet filtered Reservoir from PSC, the PSC unit is larger capacity, vented, has AN fittings, a great filtration element that’s readily available. plus it looks badass!